We were up at a reasonable time and it was nice to open the motorhome door and see the roll-out awning deployed giving us both shade, and sense of an extended living space. This was to be a fairly quiet day, a few chores, and lots of lazing around. The BBC weather forecast last night said 19˚C maximum for today, by this morning it had changed its mind to 23˚C, but I swear it was more like 25˚C this afternoon. Lunch was a lovely fresh crusty baguette filled with blue cheese and tomato washed down with a nice cool beer. 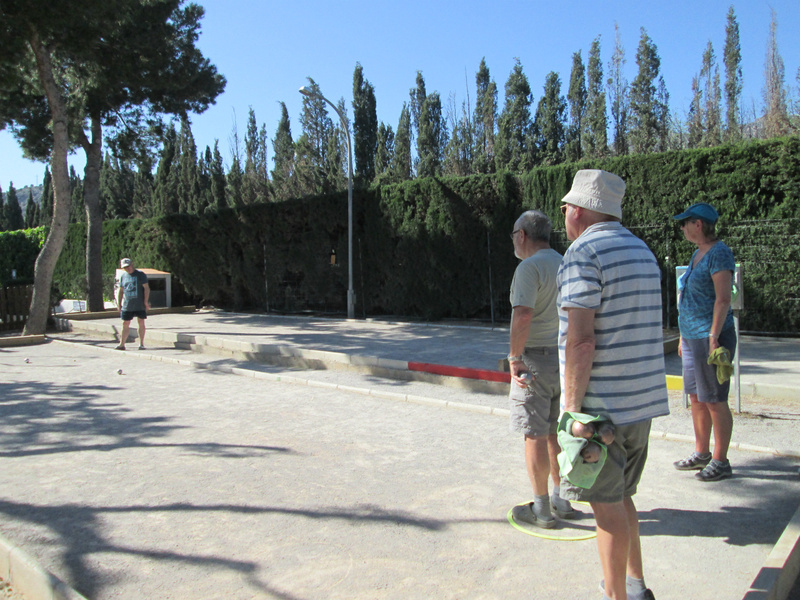 Before I knew it I was being hustled by The Chef to get ready for the Petanque session at 14:00. 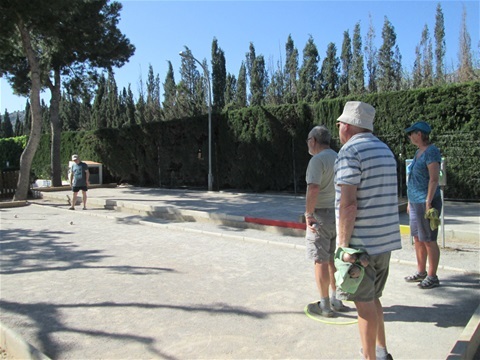 I have to say that since our first visit up there during which we met, who I assumed were the Cheltenham Ladies Lawn Tennis Club members, and their long-suffering husbands, we have only ever met very nice, helpful, likeable people up there, the kind we had hoped to meet when I first bought the Petanque balls through good old Amazon UK. They offer lots of help and advice and don't get all stressed out when we get it wrong, they just say "No worries - just enjoy it". A number of folk who were there at the beginning of the week have now left for home. This is now becoming a bit of a transit camp with folk leaving here for home being replaced by folk having left campsites further south who are stopping over here for a few days on their way home. Both mine and The Chef's games finished about the same time. I left my plastic ring, used to mark the throwing position with one of the other players up there. I may see it again, I may not, but I ordered three, so there are still two waiting for us back home, and if whoever runs off with it, if indeed they do, then they'll make good use of it I'm sure. After that very enjoyable session it was back to base camp for another relaxing session with my new book, taken from the campsite library - 'The Da Vinci Code' by Dan Brown. When I picked it off the shelf a German chap standing there told me that it was very good, so I guess it's not a comedy. According to the BBC computer-generated weather forecast we are in for some rain all day Monday and Tuesday, and so we need to try and get ourselves sorted for that. I've no wish to stay indoors for two days, and so have suggested to The Chef that we go out somewhere on the bus or train on Monday and on Tuesday we stay around the campsite on the heavy rain day so that I can keep an eye on the wind-out awning if we keep it deployed. I am still mulling over in my mind what we should be doing with our bikes. On reflection I wish we had set a budget for the bikes, and having done so looked around for second hand better quality, lighter bikes, rather than buying new, heavier, crap. I don't think The Chef's bike, even though it is identical to mine, just a different colour,is as bad as mine. But they are quite heavy and even though they fold, take up a lot of room in the rear garage. The problem is if you spend too much on a bike you get so that you're afraid to leave it anywhere for fear of it getting nicked, which defeats the object. When we were at the campsite at Ypres in Belgium (one of our favourite places) on our last trip, we hired full sized bikes for the day and they were just so much easier to ride. Problem is if we go for full-sized bikes then I have to create a bespoke carrier on the back of the motorhome which can take both the spare wheel and the bikes. Nightmare, but we need to have a think about what we want to do for the future. This evenings offering from The Chef's enormous repertoire was roast lamb with mashed potato, gravy and cauliflower. For the first time tonight she used the electric wand with the potato masher attachment. I bought it because the lightweight folding table or a predominantly glass-topped kitchen work surface are not the best surfaces on which to manually smash a saucepan full of boiled potatoes .......... I sometimes worry about who she's thinking of as she thrashes them. The Chef seemed quite happy with the results of the new fangled gizmo. Dessert was the remaining strawberries with more Greek yoghurt. This evenings meal resulted in a lot of washing up and so I offered to do the second batch over at the washing-up area. Whilst there I bumped in to the couple who run the weekly Quiz Nights. I wished then I'd had my wallet with me, perhaps I could have secured us a few more points for next week. They were saying that they are off the week after next, the wife has to have a pre-op before having her second hip replacement operation. For the second time she has decided that due to the pain she is in she will pay to have it done privately. These are two people who have devoted their lives to teaching, so probably spent most of their working days on their feet, and now have to pay to put the damage right themselves. I suggested to the wife that when they get to Calais she should get out of their tow car and climb in to the back of a UK-bound lorry. When she gets to the UK say absolutely nothing but keep pointing to her bad hip. They'll get it X-Rayed, and discover the problem, and, assuming she is a foreigner, for fear of being branded 'Racists' will arrange for an immediate hip replacement. As she leaves the hospital she can just say 'Thank you gentlemen' and make her way home. Tomorrow we have the wine tasting session in the restaurant, but not much else planned, still I'm sure something will turn up. Maybe somebody will invite us to a hairy-rat spit-roasted BBQ.